In the marketing world, businesses have moved from a pure B2C/B2B model to a P2P model (People to People). People buy from people, and customer experience should be no different. The path to business success and growth is paved with quality customer experiences (CX). CX is arguably the #1 proven way to positively impact revenue, especially over the long-term. There are usually a number of touch-points in the buyers’ journey, and if a customer is not satisfied at each one, they can very easily go elsewhere. Competition is fierce, especially in a thriving global economy. Only companies that deliver consistently superior CX will create emotional connections that are strong enough to earn customer support. Once a buyer has chosen your company the challenge is to keep them as a customer and build a relationship, reducing churn and increasing life time value. The Call Center is where the real magic happens. They provide a tremendous opportunity to solve customer challenges, inform customers new products and company initiatives, spread the word about your company culture, sell, or upsell. These interactions are more complex and therefore have the potential to delight more than at any other stage of the buyers’ journey. Companies that are constantly improving call center performance in order to provide an excellent live customer experience are companies that understand the value of creating a genuine emotional bond with customers. These same committed companies outshine the competition by taking a powerful stand to differentiate themselves by dedicating resources to call center agent training, measurement, and management in order to improve call center performance. Is that something you are willing to take on? The successful implementation of a company's CX initiatives is too important to not get right. For optimum results, each touchpoint should be monitored and quantified in a way that is measurable and ties to a direct action or actions for improving call center performance. This begins with goal-setting, quality assurance monitoring, and agent self-scoring, and ultimately leads to creating stronger emotional connections that impact the customer experience in a positive way. 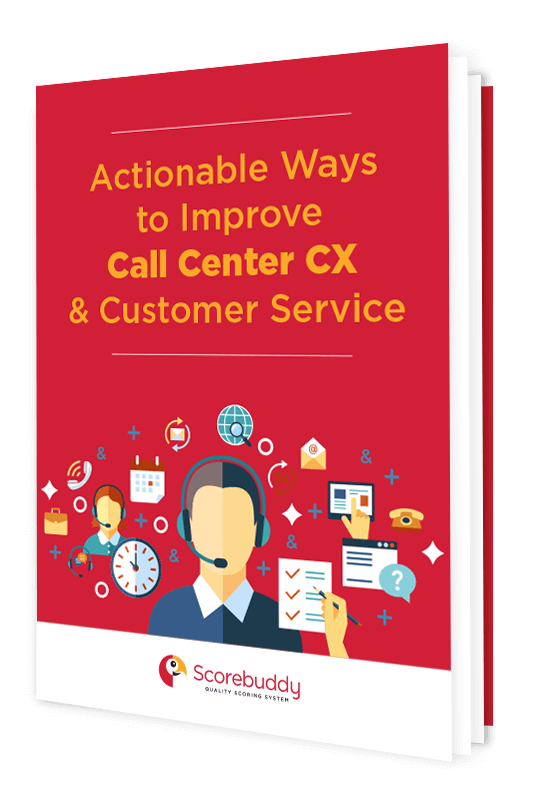 Each touchpoint of the customer journey presents an opportunity for improvement, and it is in the call center where some of the most important conversations are taking place between your company (call center agents) and your customers. “How are you?” - This simple question may come back with any number of answers. Agents will immediately know if callers are in a foul mood, if they are rushed, happy, or annoyed. By paying attention to tone and other verbal cues, agents can be more well-equipped to manage the call in a way that results in a satisfactory outcome for the customer. Clarifying questions - Asking clarifying questions to make sure agents understand the customer challenge is essential. Using the customer’s own words when phrasing the question will help them feel listened to and respected. This will also result in clearer overall communication between the agent and caller resulting in faster resolution. Elevating questions - Once the agent feels a resolution has been met, they should ask the customer if they are satisfied. This way both parties can take a step back and assess how the call went. Questions such as: “How do you feel about this solution?” or “Does this solve the issue you were having?” will give the customer the opportunity to either say yes or to be clear in saying things have not gone well, giving both caller and agent an opportunity to keep forging forward until a satisfactory resolution is met. The key way to improve customer service, and that call center agents and customer service representatives can help customers , is through managing emotions in a positive way. This may sound like a huge undertaking, but at its core, it is about listening, asking the right questions, and listening some more. A little empathy goes a long way when it comes to providing excellent customer service. It’s a painful experience being misunderstood, which is why empathy can go a long way in call center quality assurance. You probably already know this, which is why call center managers prioritize agent soft skills that demonstrate empathy in the hiring process. However, hiring candidates that have empathy is not enough: you need to create a system that places empathy at the heart of every agent’s actions and works towards actively improving call center performance and call center soft skills. When you attend a dinner party you often run into old friends and also new acquaintances. Imagine running into someone you think you’ve never met before, and yet you have actually met them before and previously spent hours talking. Your acquaintance’s reaction to your forgetfulness is unlikely to be positive! The same thing happens when an agent doesn’t have the full picture of a caller’s history. Short circuit this possibility by uniting all client information into a single unified CRM system. This will ensure that your client never has to play the role of forgotten acquaintance again. Scripts can be useful: they often speed up training and improve productivity. However, during sensitive or unique situations scripts can be counterproductive by forcing your agents into inflexible boxes. Customers who are expecting personalized service will find overly scripted calls disappointing and patronizing. Instead, empower your agents to strategically go off script by giving them the tools to do so: train your agents for scenarios not scripts and principles, not procedures. People don’t hate automated phone menus: they hate menus that are not user-friendly. We’ve all experienced having to verify our identity a dozen times, waiting through irrelevant options, and shouting the phase “main menu” a bunch of times. 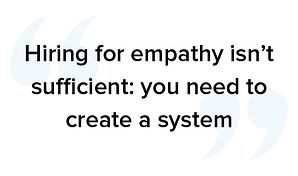 The solution is tactics: updating structure and language using an IVR menu can incorporate empathy throughout the system. A verbal prompt inviting you to press 2 if you’re experiencing poor call quality can demonstrate to a caller that you empathize with their situation. So remember to begin by asking yourself what your customer is trying to accomplish. The customer journey does not typically follow a simple path. There may be bumps along the way, challenges that require quick resolutions, upsell opportunities that might enhance their experience. Many of these touchpoints occur between customers and call center agents, so agents must be prepared to engage customers with empathy and understanding, always with the goal of creating an emotional connection. The most impactful and effective call centers will train their agents on listening and mitigation skills. They will know what questions to ask when. They will not use a script, but they will be direct. They will rephrase the customer’s words so that the customer feels understood. They will be empathetic and check-in at the end of the call to ensure that the result is satisfactory to the customer. The best part is that these interactions can be measured and quantified for improving call center performance. No agent, manager, or company needs to guess at how effective a call or call center is performing. Performance baselines may be set and benchmarked against to measure continuous improvement and risk opportunities. Scorebuddy is a solution that monitors the quality of and improves customer service and call center agent performance, and is a key factor in improving the customer journey through CX. Start a free trial with no obligation to begin enhancing the customer experience at your company in immediately actionable ways.